Exciting news, everyone! Today is Clayton Kershaw’s birthday … which is the perfect release date for the audiobook version of Brothers in Arms: Koufax, Kershaw and the Dodgers’ Extraordinary Pitching Tradition. The talented James Patrick Cronin reads my words out loud. Order the audiobook today at Audible.com using the link tinyurl.com/dodgerpitchers-audible! Or order through Amazon, where you can continue to purchase print or digital copies as well! For more information on the audiobook, go to Blackstone Library — and also visit the Brothers in Arms category here at Dodger Thoughts. If you enjoy or enjoyed Brothers in Arms in any format, please leave a review at Amazon. Thank you. Hey, guess what — the third installment of the Word to the Weisman podcast is already up! Following in the footsteps of Carl Erskine and Burt Hooton is my interview of Charlie Hough, the knuckleballing great who pitched professionally from 1966 to 1994. Because there was only a couple of pages worth of space for Hough in Brothers in Arms, there are memories galore in this conversation that didn’t make it into the book, including his journey from position player to knuckleballer, comparing and contrasting Walter Alston and Tommy Lasorda, and his thoughts on several Dodger pitchers from across the decades. Hough’s career in baseball as a player, coach and instructor covers roughly 50 years, so trust me, it’s great to hear from him. Listen below, or click here to listen on iTunes. You can also listen on Spotify. I also recommend you subscribe to the podcast, so you know the moment a new episode is available — especially helpful now, since I don’t have a set schedule. If you enjoyed this or would like to hear other interviews from me, please let me know in the comments below, or reach out to me @jonweisman on Twitter. Thanks! 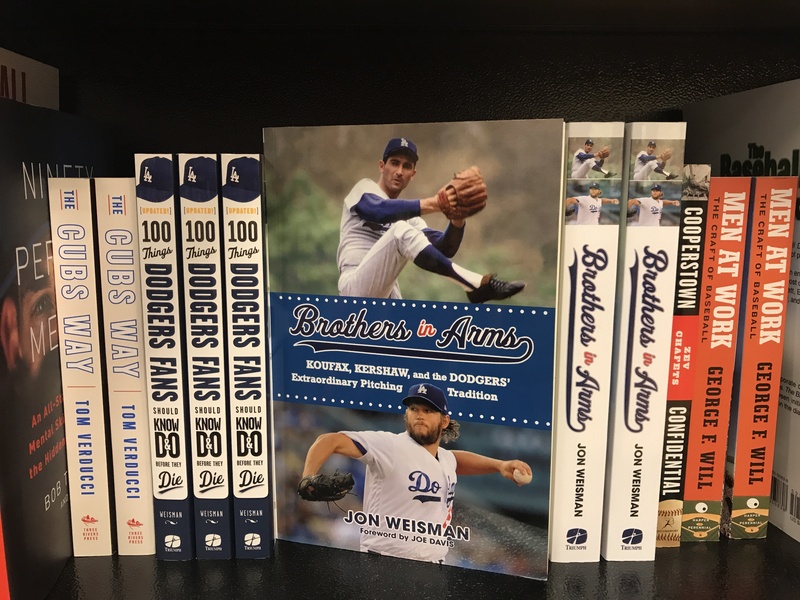 Slowly and unsurely, I am sharing some of the conversations I had while writing and researching Brothers in Arms: Koufax, Kershaw, and the Dodgers’ Extraordinary Pitching Tradition, on what I have christened the Word to the Weisman podcast. 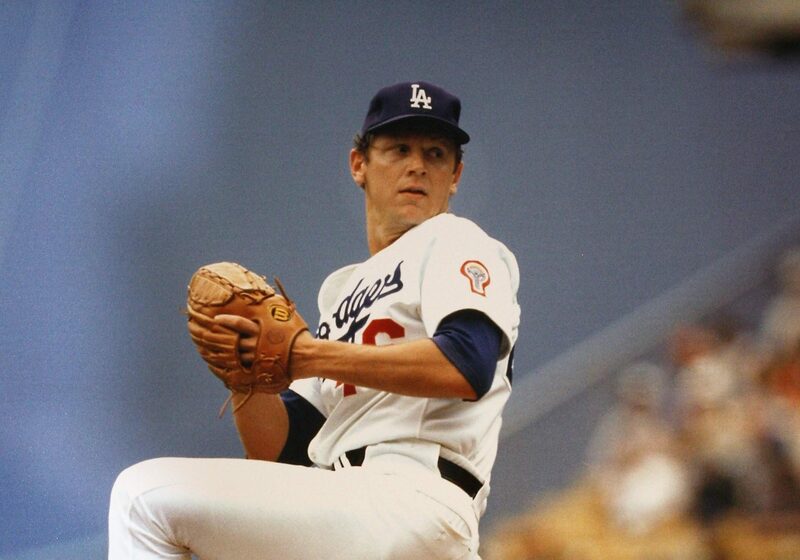 Having already posted my chat with Carl Erskine, we now move exorably but enthusiastically to Burt Hooton, whom I consider to be one of the two or three most underrated pitchers in Dodger history. Whether or not you have already read about Hooton in Brothers in Arms, I think you’ll enjoy hearing him talk about his life in baseball in his own drawl. I recommend this both for older fans like myself who saw him pitch and younger fans who might not be aware of his talent, given that the way he was overshadowed in the public eye by the likes of Don Sutton and Fernando Valenzuela. Listen below, or click here to listen on iTunes. 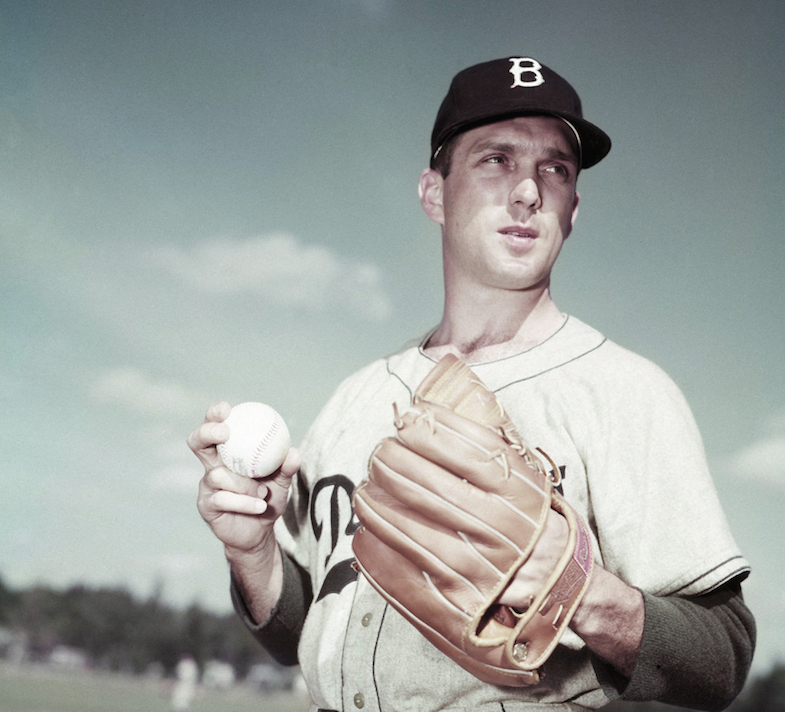 In November 2016, Carl Erskine, who pitched for the Dodgers from 1948-59, spent an hour with me on the phone for my first interview after I signed the deal to write Brothers in Arms: Koufax, Kershaw, and the Dodgers’ Extraordinary Pitching Tradition. The conversation was wonderful — something for all baseball fans to enjoy — and offered so much more than I could present in the book. Carl offers incredible detail about what it was like to come up with the Dodgers at the dawn of the Boys of Summer era. Here is an opportunity for you to hear the conversation in full. It is, technically, the first episode of a podcast that I planned to start about four years ago (but obviously, never got around to) called Word to the Weisman. You can listen to it below, or you can click here to find it on iTunes. If you enjoyed this or would like to hear other interviews from me, please let me know in the comments below, or reach out to me @jonweisman on Twitter. Me and four cool guys — Brent Knapp, Phil Gurnee, Craig Minami and Joe Bernardello — June 3 at Common Space Brewery! Hopefully, folks will be purchasing copies of Brothers in Arms: Koufax, Kershaw, and the Dodgers’ Extraordinary Pitching Tradition until the end of time. But as far as its birth in the marketplace as a new release, we are close to finishing a spring full of promotion. In fact, the last guaranteed event — perfectly timed for your Father’s Day needs — arrives at 2 p.m. June 9, with a signing and Q&A at Barnes and Noble in Burbank. I would love to see you come by and get your signed copy while getting a chance to chat about the book. A day ago, several people came by to the Common Space Brewery signing, which was great fun. Brent Knapp (friend of Dodger Thoughts and True Blue L.A.) and his crew were terrific hosts — in fact, I really recommend you stop by Common Space any old time for beer and hanging out. 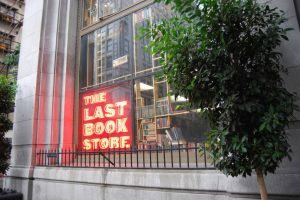 A final signing event is scheduled for June 18 at downtown’s The Last Bookstore, but that gathering is predicated on achieving a certain number of pre-sales. If you do want to come, let me know. Heading into this big final stretch, I did a whirlwind of interviews last week, the most visible perhaps being my national TV appearance on MLB Network’s High Heat with Christopher Russo — and let me tell you, man, it was a hoot. I also did radio hits on KPCC 89.3 FM’s AirTalk with Larry Mantle, and on AM 570’s Dodger pregame show with David Vassegh — I think both give you a nice taste for what’s in the book. Finally last week, I stopped by the home office of the legendary Pantone 294, where I did a lengthy podcast in which I spoke with Álex Soto, Desiree García and Matt Barrero about my entire career leading up to Brothers in Arms. You can find the audio here, and I’ll add the video when it’s up. This entire process, dating back to the first announcement of the book, has obviously felt more than a little self-indulgent, but I’m not above admitting I’ve gotten a kick out of it. (Ideally, it’s a good thing that I really enjoy talking about the book.) In any case, I truly thank everyone for indulging me through it all, and for your support. Hi everyone — I have two more Brothers in Arms interviews to share with you, each with old friends. I’ll end this quick post with one request: If you have the book (and especially if you enjoyed it), it would really mean a lot if you could rate the book and leave a review at Amazon. It doesn’t have to be a long review — even one sentence can make an important impact. I know it can be like doing homework, but I would truly appreciate it. Thanks, and my goodness, let’s get the Dodgers winning again. 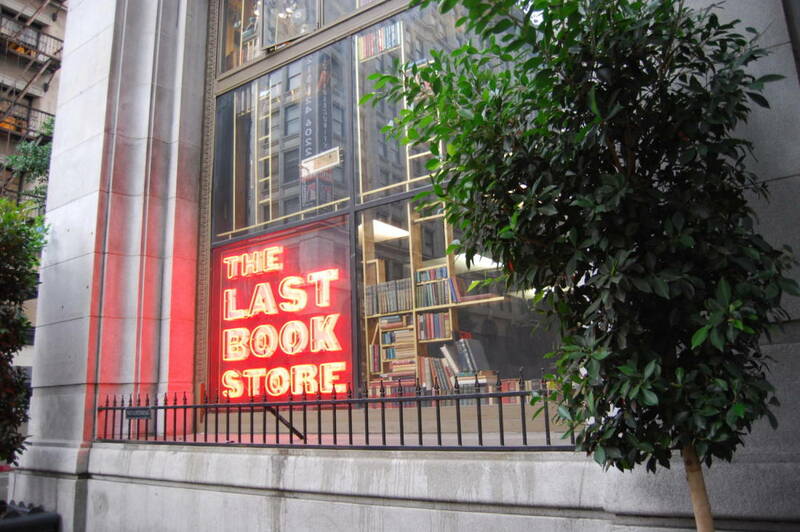 The Last Bookstore has offered to host what could be the last booksigning event for Brothers in Arms: Koufax, Kershaw, and the Dodgers’ Extraordinary Pitching Tradition — scheduled for 7 p.m. June 18. I’m planning to do a Q&A on the main stage of the humongous store, located at 453 S. Spring Street in downtown Los Angeles, and sign books thereafter. Information about directions, parking and public transportation can be found here. The Dodgers will be out of town that night, so here’s a chance to catch up with some fellow fans at a great setting. The Last Bookstore event is one of three remaining on the Brothers in Arms calendar, following June 3 at Common Space Brewery and June 9 at Barnes & Noble (Burbank). Here are a couple of fun items. 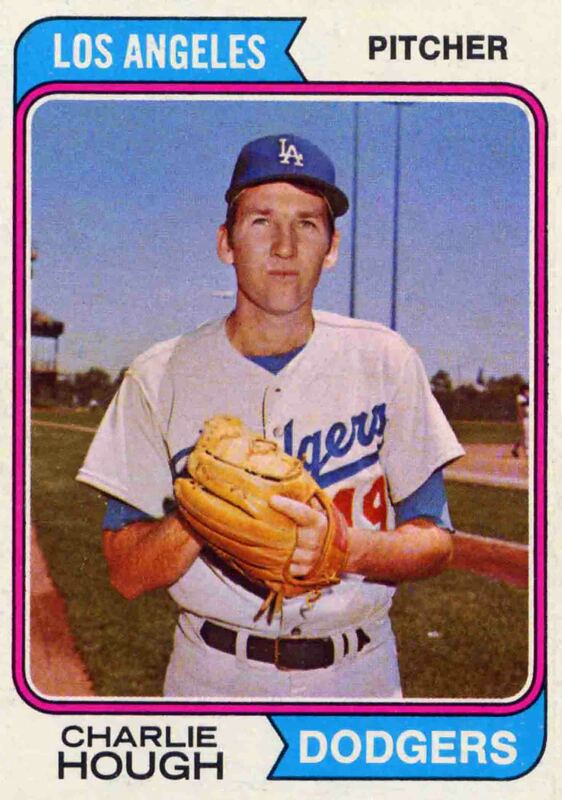 First, Dustin Nosler and Jared Massey were kind enough to have me as a guest on the Dugout Blues podcast, and we had a fun conversation, first about the Dodgers in general, then about Brothers in Arms: Koufax, Kershaw, and the Dodgers’ Extraordinary Pitching Tradition. Similarly inspired, in case you missed it, was my chat Monday on Reddit, where I spent an hour answering all kinds of questions about the book and the team. Hey everyone — as part of the Brothers in Arms global/digital book tour, I’ll be doing an AMA (that’s Ask Me Anything to the uninitiated) on Reddit at 12 noon on Monday. Come on by! Ahead of Saturday’s 2 p.m. booksigning event at the Central Library, where I will do a Q&A with senior librarian Mary McCoy, here’s an amuse-bouche from McCoy via an e-mail exchange with me. I also spoke for nearly an hour with Justin McGuire for his Baseball by the Book podcast, going deep into interesting tidbits about the Dodger pitching tradition and the process of writing about it. Enjoy checking out both, and hope to see you at the first signing Saturday! Today’s the day — the official launch day for my book, Brothers in Arms: Koufax, Kershaw, and the Dodgers’ Extraordinary Pitching Tradition. *leave a review — a few words and a positive rating can make a big difference! *spread the word about the book — on social media or via old-fashioned word of mouth. *follow @dodgers_tradition on Instagram — the official account for both Brothers in Arms and Dodger Thoughts. *plan to attend a signing — get your new or previously purchased copy of the book autographed, hear me say a few words about it and make Brothers in Arms come to life. *check out the coverage if you want to learn even more about the book. 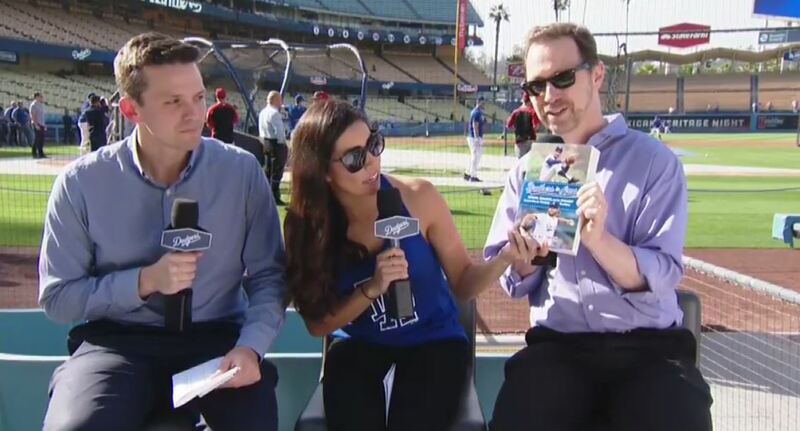 From my perspective, it feels like I’ve been promoting the book with somewhat nauseasting relentlessness, but every day, I encounter friends and/or Dodger fans who haven’t heard of it. So I would love your help in getting the word out! The Brothers in Arms: Koufax, Kershaw, and the Dodgers’ Extraordinary Pitching Tradition world tour will make its third stop, reaching beautiful downtown Burbank’s Barnes & Noble at 2 p.m. on June 9. Come on by to get your new or previously purchased copy signed, and as a bonus, I’ll introduce you to the author. Hey — that’s me. By the way, if you want to make a Dodger-themed afternoon and evening of it, it’s an easy drive down from Barnes & Noble to Dodger Stadium for the 6:10 p.m. game against the Braves, featuring a Manny Mota Bobblehead giveaway. I’m not involved with that giveaway — I just like the idea of the combo. The Barnes & Nobles signing follows fun events set for May 5 at the Central Library, and June 3 at Common Space Brewery in Hawthorne. Another announcement for mid-June is still to come. Hope to see you soon! 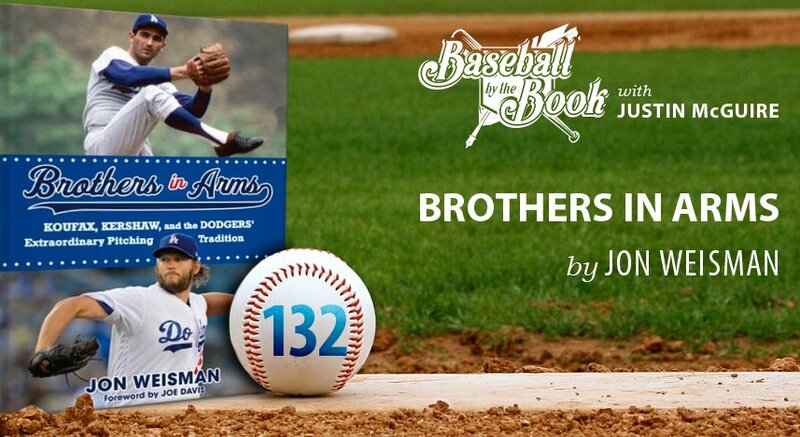 Hey folks – I’m pleased to announce my second signing event for Brothers in Arms: Koufax, Kershaw, and the Dodgers’ Extraordinary Pitching Tradition. 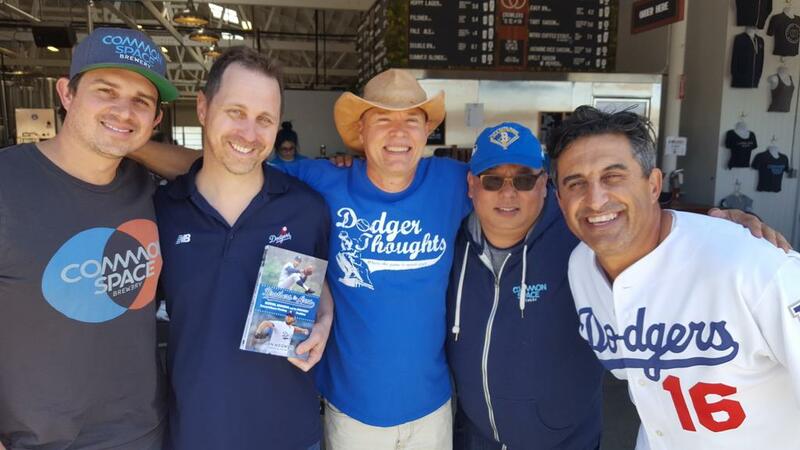 Following the May 5 event at the Central Library, I’ll be talking Brothers and selling/signing copies of the book starting at 2 p.m. June 3 at Common Space Brewery — the great new place founded by friend of Dodger Thoughts and True Blue L.A. denizen Brent Knapp — located at 3411 W. El Segundo in Hawthorne. The Dodgers are playing at Colorado starting at 12:10 p.m. that day, so with beer and books on tap, we’ll gather to hang out and watch the game, mixing in some Brothers in Arms during and/or after. 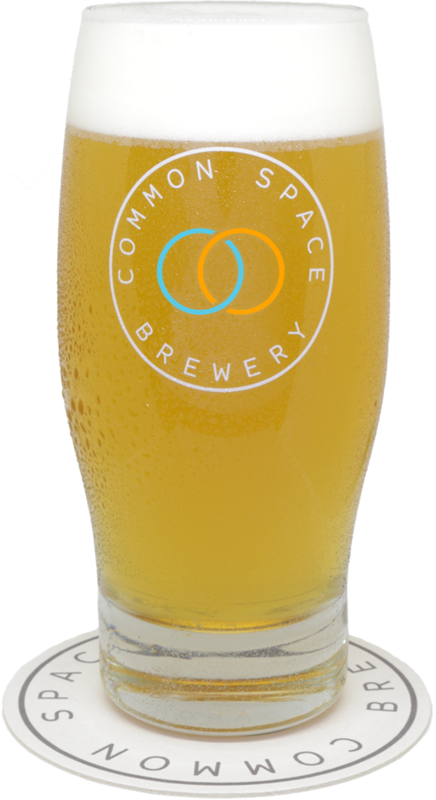 Common Space is a production brewery in Hawthorne with a large taproom and outdoor beer garden that opened in February. Bonus: Check out this week’s True Blue L.A. podcast in which I join Eric Stephen and Jacob Burch for an interview about Brothers in Arms. 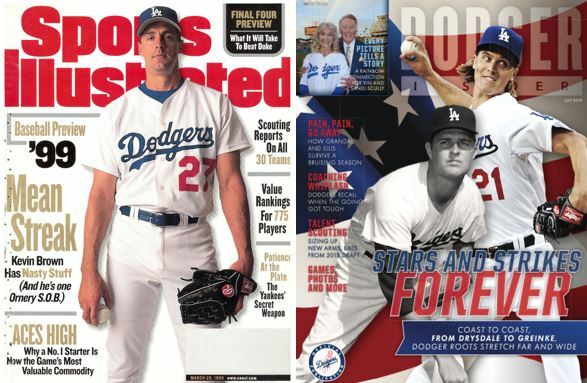 Because we already used Clayton Kershaw’s birthday as an excuse to delve into Part 9 of Brothers in Arms: Koufax, Kershaw, and the Dodgers’ Extraordinary Pitching Tradition (order now! ), our series of previews ends on Part Eight: The Bullpen. Niftily, the position of relief pitcher emerged with the Dodgers around the same time as the Dodger pitching tradition itself took root. For nearly the entire history of the Dodgers before the end of World War II, when their pitching tradition was incubating, almost every pitcher they used in relief was a moonlighting starter. Only three players in Brooklyn history totaled more than 200 innings in relief before 1940, and two of those were swingmen — Watty Clark and Sherry Smith, who started more games than they relieved. The lone exception, Rube Ehrhardt, did mainly pitch out of the pen from 1926 to 1928, with modest effectiveness. 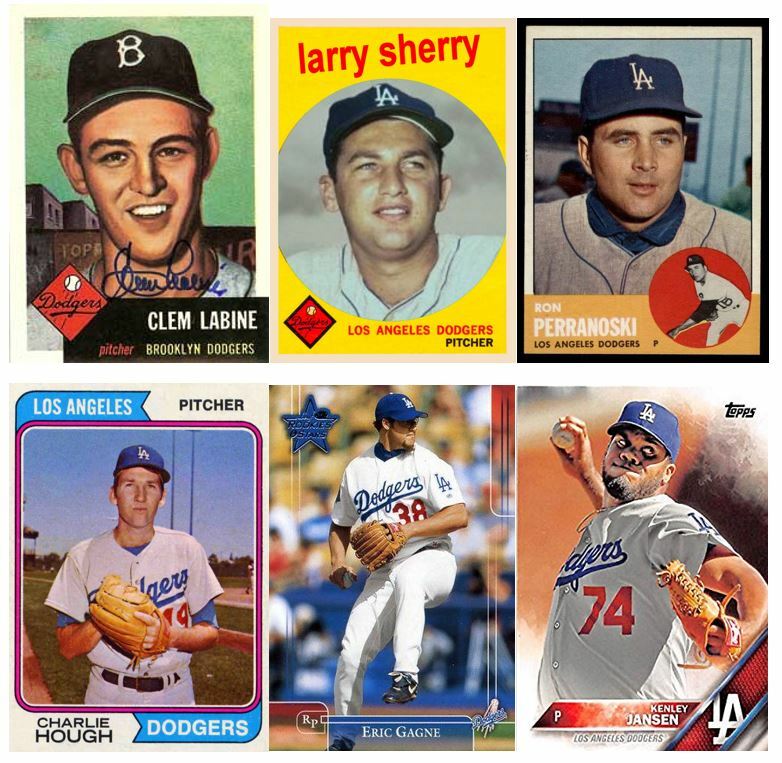 Starting with Hugh Casey in the 1940s, the game changed, and the Dodgers began transforming pitchers who weren’t cut out to be fulltime starters into pitchers who were primarily relievers, and later purely relievers. In the history of Dodger pitching, they play a supporting but key role, occasionally grabbing headlines—some heartbreaking, some thrilling. 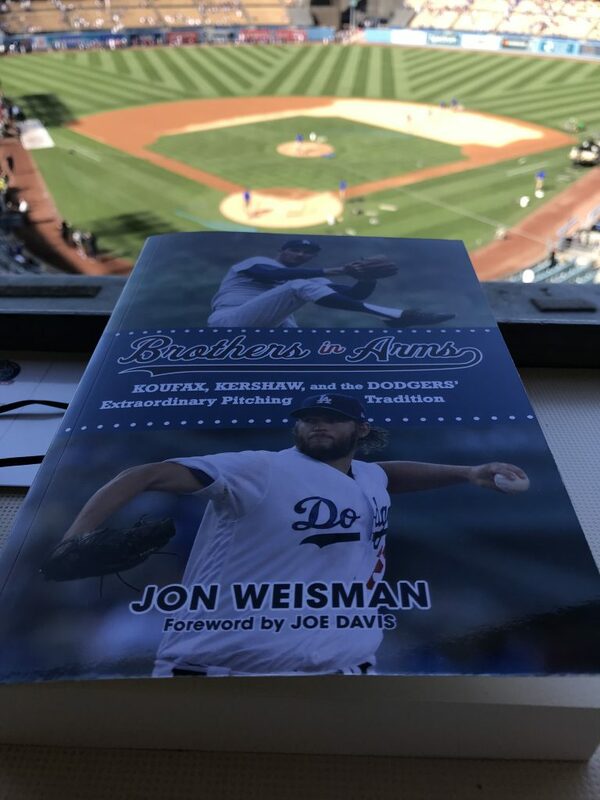 Part Seven of Brothers in Arms: Koufax, Kershaw, and the Dodgers’ Extraordinary Pitching Tradition (order now!) — “The Hired Hands” — is the book’s shortest section, but it takes us to another key transition point for the franchise. Right up until the final decade of the 20th century, the Dodgers signed or scouted, domestically or internationally, every significant starting pitcher they ever had as an amateur — or parlayed that homegrown talent into a trade for one. While the best things in life aren’t always free, the Dodgers rarely risked big dollars on pitchers from rival area codes. You could say it was pride. Or a conservative streak. Or feeling scorched by the relatively fruitless expenditures on the Dave Goltzes of the world. But as the 20th century neared an end, the Dodger pitching tradition couldn’t survive on its own momentum. The team had to begin to look elsewhere for talent.